For a country like Japan, which is located in a tectonically active area, geological information is essential for creating a safe and secure society. 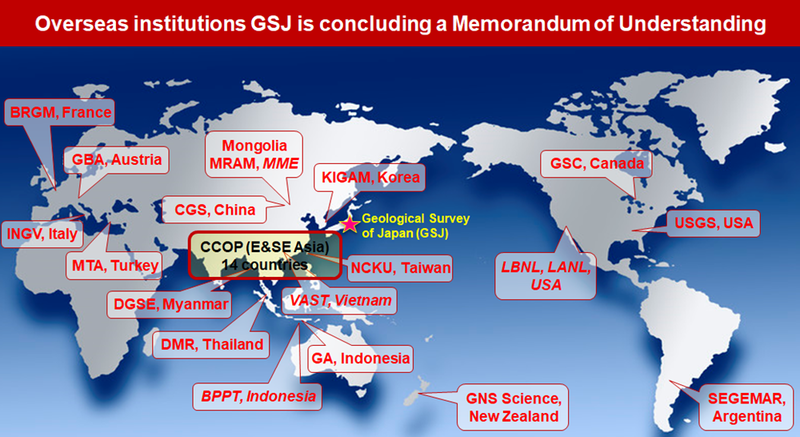 The Geological Survey of Japan (GSJ) gathers, compiles, and provides many kinds of geological information. We also develop techniques to overcome various difficulties in global environmental protection, minerals and energy resources development, and geological disaster mitigation, and promote international cooperation as a national geological survey. Geological information is fundamental information on land and the surrounding seas systematically collected and compiled on the basis of Earth science research. We keep basic Earth science maps up-to-date to meet social needs, incorporating fresh information obtained from both traditional and the latest techniques. In focusing on urban and coastal areas, we keep improving and updating our geological information and promoting its widespread use in mitigating urban disasters. The threat of geological hazards is high for the people living on the Japanese Archipelago, where seismic and volcanic activity is common. Precise and detailed information about underground geological structures, including active faults and volcanoes that can cause disasters, and more accurate forecasting of future activity are crucial for disaster mitigation. We perform research to clarify the past events of geological hazards, understand their generation mechanisms, forecast future activity, and improve disaster mitigation technology on the basis of surveys and monitoring information. The geosphere is a basic part of Earthʼs system. Not only does it provide us with natural resources, but it also closely interacts with human activities. We are investigating the material cycle system in the geosphere and establishing technologies for evaluating it so as to develop techniques to both conserve and utilize the geosphere environment. We also promote environmentally friendly approaches toward a sustainable society. Enhancing quality control and guarantee functions of geological information, we provide it as open data of a global standard. We also encourage expanded use and social acceptance of geological information as user-friendly intellectual infrastructure. We are constantly trying to enrich the quality of exhibits at the Geological Museum, which is a conduit for our research outcomes. GSJ recognizes that cooperation with overseas geological research organizations is a priority issue. Our international research activities include bilateral and multilateral cooperation. The latter is implemented within the framework of international organizations or consortia. The activities in the Coordinating Committee for Geoscience Programmes in East and Southeast Asia (CCOP) are typical examples of our multilateral cooperation. CCOP is an intergovernmental organization. Its objectives are to encourage economic development and improve quality of life in East and Southeast Asia through its projects and workshops in the field of earth science. CCOP was established with only four member countries in 1966. After a half century, it now has 14 member countries. No other international research organization has such a long history in the field of earth science. GSJ has assumed leadership of CCOP since the organization was established. We are currently promoting several projects under CCOP, namely the creation of groundwater environment maps of the major plains of Southeast Asia; a study of the geological environment of coastal areas; and the establishment of an online system for sharing geological data on member countries. OneGeology is an international initiative of the geological surveys of the world. This project was launched in 2007 with the goal of creating dynamic digital geological map data for the world and providing service to other types of geoscience data. The OneGeology Portal is available to view the geological maps in the world (OneGeology Portal). The Commission for the Geological Map of the World (CGMW) is an international non-profit association governed by French law, established in 1913 at the 12th International Geological Congress (IGC). The CGMW is responsible for designing, promoting, coordinating, preparing and publishing small-scale thematic Earth Science maps of the globe, continent, major regions and oceans. The CGMW is affiliated to the International Union of Geological Sciences (IUGS) and to the International Union of Geodesy and Geophysics (IUGG), and is supported by UNESCO. GSJ has been cooperated with other Asia-Pacific countries in the activities of Asia-Pacific Region Global Earthquake and Volcanic Eruption Risk Management (G-EVER) since 2012. The project includes compilation and improvement of seismic and volcanic data, hazard information sharing, and international standardization of earthquake and volcanic information to assess the risks of earthquake and volcanic hazards. The compiled data are available from following links. Bilateral research cooperation is promoted under a memorandum of understanding with a number of overseas geological institutes. In cooperation with geological institutes in the so-called industrialized nations, main activities include developing innovative survey and analysis techniques applicable to research in such fields as earthquake, tsunami, and volcanic hazard assessment; the development of geothermal resources; and CO2 geological storage. Through many years of partnership, solid relationships and mutual trust have been built. In cooperating with the so-called developing nations, priority is given to understanding the scientific and technical needs of the counterparts, as well as scientific issues GSJ should tackle. Through joint activities such as geological surveys, GSJ provides cooperation in human resource development and the compilation of geological information for resource development and natural disaster mitigation.